Публикувано от bairozan в 18:19 ч.
baymoondesign 7 април 2019 г., 19:15 ч.
I love your Washi focal. It is so cute and creative. The focal that you created for the first necklace is beautiful. Well done! bairozan 8 април 2019 г., 14:26 ч.
Michelle 7 април 2019 г., 21:05 ч. Both of those pieces are beautiful! I’m glad you didn’t let a lost package slow you down! bairozan 8 април 2019 г., 14:59 ч.
CraftyHope 8 април 2019 г., 0:23 ч.
I love both of these so much! The first one definitely scream spring to me. There's so much light and loveliness to it. And, the second one calls to me because of it's mixed media-ness. You know I can't resist that! :) Great job going on with the show despite not receiving your package. That's inspiring!! bairozan 8 април 2019 г., 15:01 ч.
Marianne Baxter 8 април 2019 г., 2:24 ч.
I really like what you made especially the first one it is so delicate looking. I sure hope you get your package soon. bairozan 8 април 2019 г., 15:14 ч. Thank you, Marianne! I'm glad you think the first pendant is delicate, it was my intention, too! KariAsburyJewelry 8 април 2019 г., 2:50 ч. Beautiful pieces! I'm so sorry your package hasn't appeared...yet... But so glad you just went with it and created from your own bead stash. bairozan 8 април 2019 г., 15:16 ч.
Lois 8 април 2019 г., 6:34 ч. Love your Spring inspired pieces. Hope you had a fun time. bairozan 8 април 2019 г., 15:17 ч.
Divya N 8 април 2019 г., 16:42 ч.
I wish you had told me that your parcel was lost.I would have sent you one. I have always wanted to pair up with you. Anyway, I appreciate your enthusiasm to participate and you have made 2 very lovely pieces. The firs necklace is simple and stunning. bairozan 8 април 2019 г., 18:22 ч.
LYILHA 8 април 2019 г., 22:32 ч. Beautiful work! 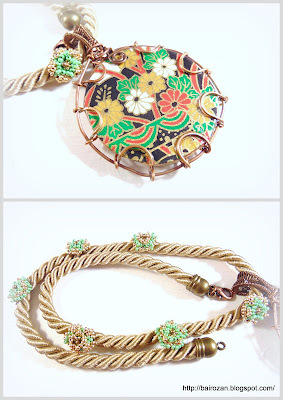 My favorite is the daffodil one - you showcased the beautiful bead so well! bairozan 9 април 2019 г., 10:12 ч.
Penny Jane 10 април 2019 г., 1:30 ч.
Oh my goodness! Your wirework is divine. You’ve made such beautiful things and I’m glad you still joined in. Being an international swapper can be a bit of a challenge - it was me last year that didn’t get mine in time. This year mine arrived 4 days before the deadline! I still enjoy it every time though. bairozan 10 април 2019 г., 12:45 ч.
Tammy Adams 10 април 2019 г., 16:48 ч. How disappointing that your swap package did not arrive. I was nervously watching the package tracking info for what I sent my partner and crossing my fingers it would not get lost. I'm glad you decided to participate with your own beads. I am always impressed with your wire work. It looks so effortless, but I know it takes skill and practice. (I know because I've tried it and my pieces never looked so good.) Beautiful designs. bairozan 15 април 2019 г., 12:11 ч. Dry Gulch 10 април 2019 г., 17:52 ч. Your washi necklace is so pretty! bairozan 15 април 2019 г., 12:12 ч.
Linda A. 11 април 2019 г., 0:16 ч.
bairozan 15 април 2019 г., 12:16 ч.